Provide comfort for the family of Sandra Bachinski with a meaningful gesture of sympathy. 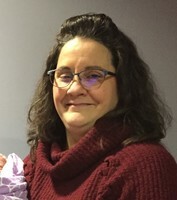 Sandra (Sandy) Jo Bachinski, 53, of Manistee, died peacefully at home with family on December 31, 2018. Sandy was born on March 10, 1965 in Manistee, Michigan to her parents, James and Patricia Faubert. She attended Manistee High School and graduated in the Class of 1983. Sandy met her husband, Patrick, while in high school and were together until they were later married on July 19, 1995. Sandy’s greatest joy was being a mother. They welcomed their first child, Colin David, on October 30, 1995. Years later on November 11, 1999, they welcomed their second child, Austin James. Sandy was a natural nurturer and when caring for her young children came easily to her. She made days off of work with her sons always interesting, whether it was running errands with them or simply being at home spending time with them. Some of Sandy’s proudest moments was following her sons, nieces, and nephews in all levels of activities. From Manistee and Manistee Catholic to Bear Lake, to Mason County Central and Grand Haven, Sandy could be found cheering her family on many different fields, whether athletics or fine arts. She ended up following her love of basketball to the bench when she started to coach 7th grade girls basketball in 2005. She thoroughly enjoyed the time she spent with the girls she coached and loved developing not only young athletes, but young ladies. Sandy also thoroughly enjoyed taking walks on the beach, visiting, watching the beautiful Manistee sunsets with her sisters. It was during these times Sandy was able to unwind and relax after long days at work with the girls that she grew up with and still held close. Sandy was known by many from her many years working at Big Al’s. Sandy was recently working at Bob’s Roofing Co. as the Manistee Secretary, which she enjoyed very much. She was also a member of the Divine Mercy Parish in Manistee, Michigan. Sandy is survived by her husband, Patrick; sons, Colin (Molly Morang) and Austin; mother, Patricia Faubert; mother-in-law, Lorraine Bachinski; sisters, Brenda (Dave) Tiefenthal and Deb Bayle; brothers, Gary (Jennifer) Faubert and Jeff Faubert; two close cousins that Sandy considered sisters, LeAnne (Jacob) Bialik and Tina (Tod) Miller; her sister-in-law that she considered a sister, Julie Bachinski; and numerous nieces and nephews: Ryan Tiefenthal, Sam Bayle, Jared (Hillary) Faubert, Ashley Tiefenthal, Becca Bayle, Sarah Faubert, and Danielle Tiefenthal. She is also survived by her brothers and sisters-in-laws, Tom (Peggy), Susan, Robert, Phil (Paul); and nephews, Nick (Frankie) and Tim. In addition to her nieces and nephews, Sandy also had a great nephew, Tripp, and great niece, Nora, that meant a lot to her. Also, Sandy is also survived by numerous aunts, uncles, and other cousins. Sandy was preceded in death by her father, James Faubert; father-in-law, Charles Bachinski; grandparents, Earl (Jim) and Wanita (Chiquita) Overla; uncles Russ and Jack Overla, and by her nephew, Andy Tiefenthal. A celebration of life will take place this coming Saturday, January 5, 2019 at Oak Grove Funeral Home & Cremation Center from 3:00 to 6:00 PM. In lieu of flowers, contributions can be made in memory of Sandy Bachinski to the “Stomp Out Cancer” Fund at P.O. Box 783, Manistee, Michigan 49660 or through online donations at www.soc-fund.org/donations/. To send flowers in memory of Sandra Jo Bachinski, please visit our Heartfelt Sympathies Store. Celebration of Life will be from 3:00 PM - 6:00 PM.